What can a carmaker do after it has unleashed a nearly-perfect sedan that the public loves, and the critics love even more? This was the dilemma facing Kia after its Optima rocketed to best-selling status and became the new kid on the block. After all, the Kia Optima offers awesome styling, a luxurious interior, and a price that beats the pants off the competition, so it's no wonder it has captured the imagination of automotive fans and reviewers. But how do they top themselves? How can Kia possibly follow an act as captivating and popular as the Optima? 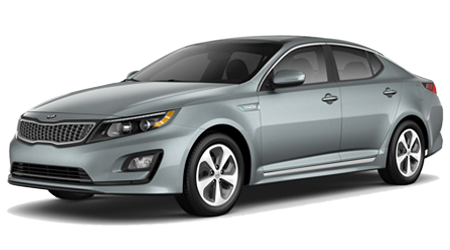 Meet the Optima Hybrid! Every bit as spectacular as the traditional Optima, the 2016 Optima Hybrid gives you all the panache and power, with an incredible EPA-estimated 40 mpg on the highway. That amounts to fuel efficiency that is unheard in a large passenger car, even among hybrids. The 2016 Optima Hybrid was released several months after the regular 2016 Optima, so it is literally just hitting the dealerships right now. We have a great selection of the new Optima Hybrid in all the available trim levels and colors at Cumberland Kia, located at 1560 Interstate Dr in Cookeville, TN, and close to our neighbors in Lebanon, Crossville, Mcminville, Franklin, and Chattanooga. Drop by our spacious facility and test drive the stately new Kia Optima Hybrid. Like its redesigned and dynamic exterior, the inside of the Optima is breathtaking. With sumptuous seating, available Nappa leather upholstery, and real metal trim everywhere you look, the 2016 Optima crushes the competition - again! The futuristic dash offers split-level infotainment with a display screen set above the digital control panel. The whole cockpit is marked by simple, clean lines, and teeming with cutting-edge technology. The available Premium Package offers the best of everything: adaptive cruise control, front-collision warning, an electronic parking brake, lane-departure warning, and an autonomous emergency braking system that applies the brakes automatically to avoid impact. The secret of the Optima Hybrid's appeal is no secret at all - it gives you more for less. The 2016 Kia Optima Hybrid boasts a dynamic 2.4L four-cylinder engine working with a plucky 47-hp electric motor, for a combined 199 hp. Old-school purists will appreciate the absence of a Continuously Variable Transmission, which is all the rage nowadays, but which leaves many drivers feeling unsatisfied. The 6-speed automatic in the new Optima Hybrid feels smooth and familiar. It's not a plug-in. It runs on gasoline with the help of an electric motor, and it proudly gives you an EPA-estimated fuel economy of 36 mpg city/40 highway/38 combined. Not bad for a big, powerful king of the road. The fuel-saving is further enhanced by special vents in the front to make it more aerodynamic, and by new lightweight aluminum used in the structure. There are two trims for the Optima Hybrid in 2016: the Hybrid LX and the superior Hybrid EX. As mentioned, the 2016 Kia Optima Hybrid has just arrived at dealerships nationwide - better late than never - and Cumberland Kia, TN, has a large inventory waiting for your approval. Here is the history of the hybrid car in a nutshell. 1901: the first hybrid gasoline and electric car is invented. 1975: the invention of regenerative braking puts hybrid technology back on the front burner. 2015: Kia shows the world that hybrid cars can finally match their internal combustion ancestors in performance and price. See for yourself in our showroom at 1560 Interstate Dr in Cookeville, TN, also serving Lebanon, Crossville, Mcminville, Franklin, and Chattanooga. See ya in a Kia!